Canberra is renowned for its vicious storms. You no doubt felt the lashing we took in January 2017 that had us repairing roofs all over the capital, while many of you will remember the pounding in 2007 that created hail drifts as high as one metre. If the next storm causes damage to your roof that requires immediate repair your first action should be to phone National Capital Roofing on 0407 212 491. Our fully qualified professional roofers will be on their way to fix the problem as soon as possible. Meanwhile, here are some other tips to help you deal with emergency roof damage. 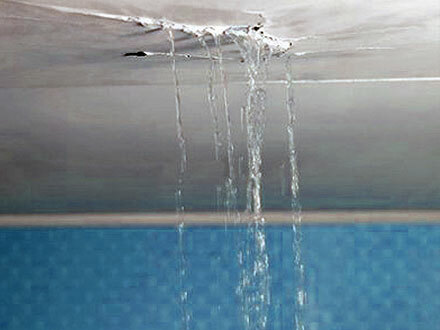 In most cases, emergency roof damage occurs during wild weather, generally a storm of some kind. This is not the best time to be outside staring at your roof and it's most definitely a bad time to be reaching for your ladder. Before you do anything make sure that yourself and your family continue to be safe. For instance, if the damage to your roof has been caused by a tree branch falling, check and be certain that it hasn't brought any power lines down with it. Most storms are relatively short-lived, particularly as far inland as Canberra is, and they generally pass over quite quickly. It's usually a good idea to stay inside until the worst of it has passed. If tiles have started flying off your roof there is no guarantee that more won't follow and the last thing you want is to be caught in their path. All damage to your home can be repaired, no matter how severe, while no such guarantee can be made for your health. Of course, if an entire tree falls on your house it may compromise the structural integrity of the entire building. In that case the safest option for you and your family would be to leave immediately. When your roof is damaged it's very tempting to pull out a ladder and have a go at fixing it by yourself. This is perfectly understandable but it is absolutely the wrong option. The main motive is to save money, but it's nearly impossible for an unqualified person to properly fix a roof and it almost always ends up costing more than it would have if you'd simply contacted a professional. Even if you stop the roof from leaking, there are many other forms of damage that you won't be able to repair and likely won't even notice. Severe storms often bring a flood of con-men who capitalise on the storm damage to make a quick buck. It's the perfect time for them to strike because the licensed and qualified roofers with strong reputations, such as National Capital Roofing, are inundated with requests for help and it may take us a while to get to every house. In those circumstances it's important that you're patient. We will get to your roof as quickly as possible and guarantee we will do a good job, a guarantee that is firmly backed up by the warranties we offer.